-- Please Choose an Option --	4" 6"
These Cedar Feathers come in 18 color combos. These Feathers are rigged with 100# Izorline leaders, barrel swivels, and a 9/0 offshore single hook. Cedar Feathers have long been the choice of the charter fishing fleet when pursuing school tuna. 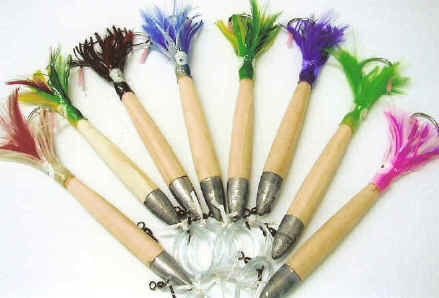 Click the button below to add the Ballyhood 4" or 6" Cedar Feather Tuna Lures to your wish list.